Why do the Blood Falls “bleed”? 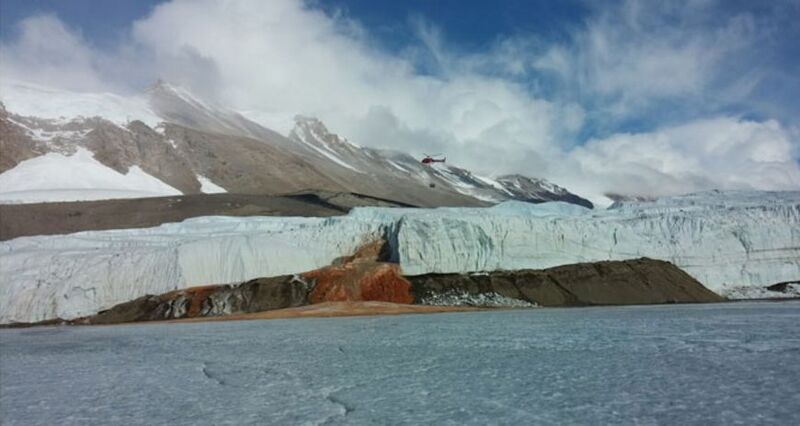 In the middle of the spotless and shiny Taylor Glacier in the Antarctic a blood-red stream flows downhill to the valley – the so-called “Blood Falls”. It is a unique phenomenon worldwide. The background for this red waterfall is explained here by the glaciologist Heinrich Miller from the Alfred Wegener Institute, Helmholtz Centre for Polar and Marine Research. The tongue at the end of the Taylor Glacier is very steep, vertical. Red-coloured water flows out here at irregular intervals through crevices and cracks in the ice. It stops flowing at low temperatures, freezes rapidly and turns into a frozen waterfall. This red wall was observed at the beginning of the 20th century, and the explorers presumed at first – like in the Alps – that snow algae was the source for the discolouration. But in the meantime we know the truth: Under the Glacier there is a pool of seawater that originates from a time when the sea-level was higher. This water has been completely shut off from the sea for the last 1.5 to 2 million years, and ever since then a toxic cocktail consisting of salt and sulphur has developed, covered by a thick layer of ice about 400 metres thick. But life in this sea went on – without light and without oxygen. How? Through the ages, minerals such as iron were released from the stone and became liquefied in the water. This is the source of energy for the organisms living there. It can be said that the microbes breathe sulphur and live off the iron. In the process they form iron (II) ions, i.e. charged iron atoms. And because there is no oxygen in the sea, the ions don’t oxidise there. But when the water flows through the cracks to the surface, the ions rust immediately and colour it red. Even when it sometimes takes many years before new water escapes, the frozen red stream can always be seen at the front of the glacier. The scientific significance of this phenomenon has little to do with the optical appeal. It is more likely in this case that we can find out how microbes develop under the most inhospitable conditions.